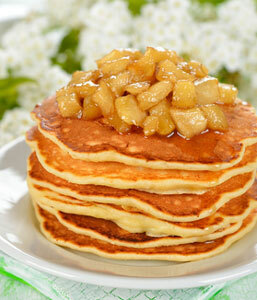 Having a range of healthy pancake topping recipes will transform your pancakes into memorable meals. Unless your pancakes are filled with fruit, sometimes they need a little extra flavor. Nothing beats a berry syrup, some honey butter, or if you want to be super healthy, a creamy cheese topping made from cottage cheese. Add all ingredients to a food processor or blender and blend for about 30 seconds or until smooth. 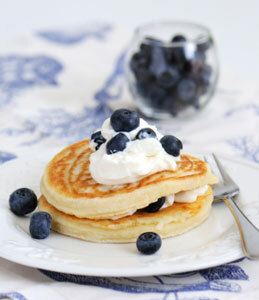 Serve immediately with fresh pancakes. To store place in a storage container with a tight-fitting lid, and refrigerate for about a week. Place the butter and honey in a small bowl and beat until pale and fluffy. A hand-held electric mixer would be ideal for this. Place the strawberries and maple syrup in a saucepan over a medium heat and stir. 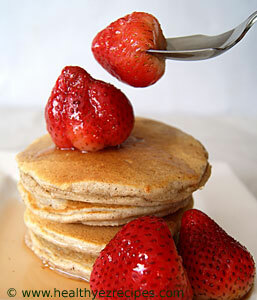 Gently cook for 1 – 2 minutes or until the berries are warm and well coated in the syrup. Combine berries, maple syrup and cinnamon in a saucepan. Cook over medium heat until heated and berries are covered in syrup. Serve warm over pancakes. Melt butter in pan over medium heat. Add can of pie apples, brown sugar and cinnamon. Stir frequently until the apples are warm and coated with the sugar and cinnamon.